When should my sale be open? 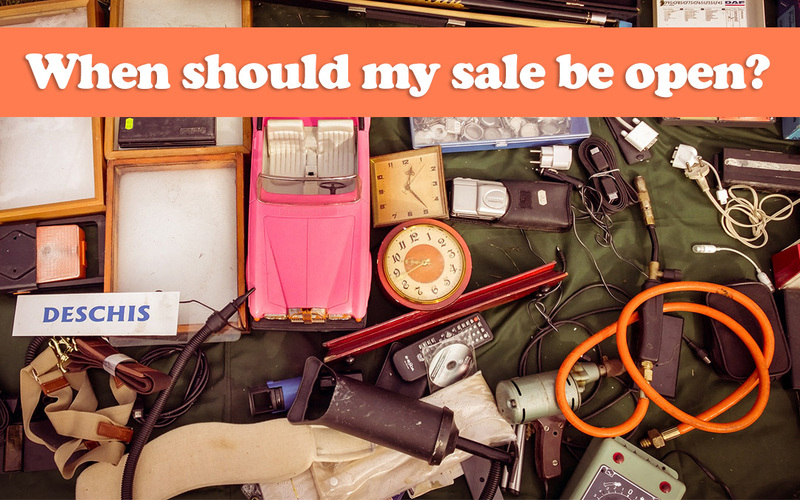 There are several factors to consider when you decide on your sale’s open/close times, including when you’re personally available to run it, and how close you are to other garage sales. Which days should my sale be open? Another 19% were open on Sunday, since the 2017 event included Sunday. In short, Saturday is the best day for your sale to be open, so you can capitalize on high numbers of out-of-town shoppers. That said, there are usually over 200 sales on Saturday from 8AM-12PM—that doesn’t give shoppers much time to get to all of the sales. If you can, include some Thursday or Friday hours. What hours should my sale be open? My personal favorite shopping time is Thursday evenings, from 4PM-7PM. I love a good sale that’s never been shopped, and Thursday night tends to be busy in the bigger neighborhoods. Once the list opens (May 24), the image below will automatically update with the most common open and close times for each day. Want to change your open/close times? Find out how. The table above only tells you the single most popular open/close time. Want to know more? See bar charts with even more open/close time detail. Serious yard sale shoppers plan their routes in advance, and they aim to be the first shopper at every sale. If your yard sale starts a little earlier than the rest, you’ll be the first stop on their routes. Don’t set a starting time that’s later than other area sales. By the time your sale starts, your potential customers may be out of both steam and cash. DON’T choose an open-close time too close to when you need to be somewhere else. You’ll need to do a few minutes of setup before you can officially “open” (setting out driveway items) and some take-down before you can “close” (e.g., taking the driveway items inside). DO find someone else to work your sale for you, or wait until another weekend, if you can’t be open on the most popular peak times. DON’T open your garage door until you’re ready for shoppers—even if you don’t have a sign out or anything. I know from firsthand experience, an open garage door and tables of merch will bring a swarm of shoppers. Everyone loves to be first at a garage sale! We know from past years that the “big 4” North Liberty neighborhoods have a lot of sales. I’m talking about Cedar Springs, Fox Run, Deerfield, and Arlington Ridge. So if you’re in one of these, you’ll likely get good foot traffic pretty much whenever you’re open. Even if your hours are wonky, there’s a good chance someone else in your neighborhood is open at the same time as you. If you’re located in a neighborhood with fewer sales, it’s even more important to align with the peak hours. Folks are less willing to trek to a neighborhood with only one garage sale, especially if they are just browsing. Try to partner with your neighbors and be open the same days and times, if possible. That will help all of you to get more traffic. Let us help you hold a garage sale that's stellar. Get tips on pricing, layout, setup, prepping, and more. What is Garage Sale 101? (c) North Liberty Garage Sales. The organizers of the sales are not responsible for the accuracy of information about specific garage sales; if you have an issue, take it up with the seller.